Hindsight is 20/20 they say. Experience comes with time. We make mistakes, we learn, and hopefully, we do better next time. Stepping out to run a freelance business is going to take some trial and error. 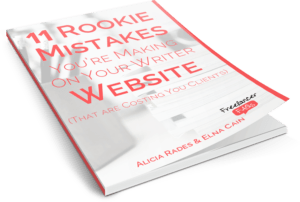 Just about all freelancers can list the mistakes they made when first starting out. Even though I’m three years into freelancing, I still feel like I’m in the trenches. I still learn something every day. I’m still finding my groove. I jumped headlong into freelancing and, boy, was it a learning curve. The amount of knowledge I’ve picked up along the way is actually quite astounding to me. When I look back at my clueless and naive start, there are a few things I wish I had known back then. Today I’ll share three tips that, hopefully, can help make the journey a bit smoother if you’re just starting out. Let’s start at the beginning. And I say the beginning, because one of the first things you should do is set up a website! I’m not a techie – not by a long shot. In fact, I loathe technical stuff. Setting up a website, search engine optimization, digital marketing metrics, blogging, Google Analytics, Adwords, keywords, plugins, shortcodes, web hosting – all foreign to me at the time! I was like a deer caught in headlights. My brain went into a spin. The one thing I did do right in the beginning was immediately set up a website. My only wish was to have known what I was doing. It was painful, and to this day, still is. I have only just got around to updating my website with a new theme, content and design. I literally procrastinated on this for two years. When I started, I read up on all of this. I basically taught myself. I eventually managed to get a WordPress site up and running – albeit it nothing fancy at the time. But as long as it was there – I was officially in business. Lesson: My suggestion to anyone who struggles with the technical stuff or things like accounting matters (another weakness of mine) is to outsource it, if you can afford to. I wasn’t in a position to pay someone to do this, so I had to battle it out on my own. But if these aspects of your business are not your forte, farm it out. It will save you hours, days, and weeks of time and frustration. That’s time you could be putting to better use, like applying for writing gigs or pitching publications. Plus an expert will do a much better job of it! This piece of advice is given by just about all seasoned freelancers. I wish I had paid more attention to it earlier. I’d probably be further along in my freelance career by now. Sure, in all likelihood you’re going to start out being a generalist. After all, when you’re new and money is in short supply, any work is better than no work. That’s fine. In many cases, freelancers slowly and naturally gravitate towards certain topics and niches. Establishing yourself as an authority in a subject means it becomes easier to find work. You can earn better rates than generalist writers. Remember, clients are paying for your knowledge and expertise in the subject, not just your writing skills. Once you have your niche (it can be more than one), start a blog on it and regularly post good quality content. A great blog shows your knowledge on the topic and you will be amazed at the leads a blog creates. It starts to grab the attention of potential clients, and work will literally start falling into your lap as a result of inquiries from people who have read your blog. Lesson: Sure, you can let your niche(s) unfold in time, however, picking one earlier in your freelance career will get you to where you want to be much sooner. Here’s one of the best pieces of advices for freelancers I came across: stop thinking of yourself as a freelancer and think of yourself as a business. That one shift in thinking can mean the difference between a mediocre business and a thriving one. It’s true. There’s a certain perception the business world has of freelancers and is the reason they tend to mess freelancers around. They tend to view freelancers as a bottom line expense and one that can wait to be paid. They don’t apply the same weight to a freelancer as they do to a business. But repackage what you do in different language, for example – “I own a business that focuses on Inbound Marketing Writing” OR “My business specializes in B2B Copywriting.” Not only does it specify your niche, it changes how you are viewed in the marketplace. The fact is, you ARE a business. The lack of external premises and staff makes you no less of a business than the coffee shop on the corner. You have work to do and deadlines to meet. You invest in marketing to find clients. All of this means, you are running a business. To help see yourself as a business, get your house in order. Set up systems to keep track of workflow, income and expenditure, admin, and have contracts in place with long-term clients. Get a decent invoicing system in place. Knocking out invoices in Excel is fine in the short term, but you’ll eventually get yourself tangled up in knots not being able to remember what the last invoice number was that you used. (I can personally attest to that!). Invoice2Go is a good option. Lesson: Once you shift your thinking from freelancer to business owner there’s also a shift in power. Prospects now see you as a serious contender to do business with, and not just a lowly freelancer they can push around. Freelancers often struggle to get paid on time. Serious business owners don’t. Remember, your own freelance journey will be different to mine and any other freelancer. There’s no right or wrong and no cast-in-stone magic formula. Everyone finds their own way in their own time and we all learn as we go along. Got a good tip of your own? Please share this with us in the comments. How Do I Expand My Niche as a Freelance Writer? Do I Really Need a Writing Niche(s)? Addict and is Huffington Post blogger. Visit her website or connect with her on Twitter. Hey Deevra, great advice and I couldn’t agree more especially on the techinical stuff. I’m still figuring it out on a shoestring and though I learned a ton…it’s time to outsource it. As with point #3….you convinced me…I’m going to rename myself as an author or writer rather than a ‘ freelance’ writer. Even to me it sounds ‘cheaper’. We can’t have that, can we :)? I really liked this post. It was simple and effective. Out of the three points, the third, “Be-Business Minded” and not calling oneself a freelancer, makes so much sense! Thanks Zahra – glad you liked the post and it was useful. Wishing you all the best on your freelance journey!